I still can't believe that Wabi Sabi was not even honored at ALA! What were they thinking? For me this book is so rich, tactile, organic, ORIGINAL, and decidedly distinguished that it's one of my all time favorites. Ed Young gets my gold medal hands down! I really like the cover art. I'll check this book out. And as far as awards go, they only mean so much. You are so right Leslie! My father won many awards as a designer. When he retired he put the awards in a box and put the box in a closet. I completely agree that Wabi Sabi was incorrectly passed over for both text and art. I love this book. I love the essence of this book and the sparseness of text. The art is outstanding, original and timeless. Hopefully, Wabi Sabi will win in sales and longevity on the bookshelf. I am also in COMPLETE agreement! I have had this book on my desk since it came in a couple of weeks ago. I can't bear to give it up (and let someone else borrow it!). It's so gorgeous, I've got to think that it didn't make it to any committee on time for consideration. Seriously, sometime you just have to shake your head when it comes to awards. Time and truth with win out. I couldn't agree with you more. I think WABI SABI is one of Ed Young's finest books. I think his art in it is exceptional. BTW, do you know the story of the first set of illustrations that Young did for the book? Young left them at the home of his agent and they disappeared! He had to do the illustrations again. The original artwork was found sometime later in a church. My friend Alvina Ling was an editor for the book. She wrote a few posts about it for Blue Rose Girls last year. Here's the URL to Alvina's 4th post about WABI SABI. The post includes links to all her other posts about the book's illustrations and lost art. Jill: I think you're right and Wabi Sabi may yet become a classic. L.: I agree with your agreement. David: You're right. Get a copy editor! Elaine: Yes, I did read the entire story about the lost art, and that added to the mystique and aura of the book. I'm also puzzled by the snubbing of Kadir Nelson's We Are The Ship, some eight years in the making. I don't yet own the book but it looks magnificent on Kadir's website. Last night at bedtime I read Wabi Sabi to my 8 year old. He kept touching the pictures, completely in awe of the Young's art. The story and haiku lulled him into a wonderfully peaceful place. He loved this book. I did not read him the foreword that defines wabi sabi. At the end of the book he jumped in and said, "I think I know what wabi sabi is...." We talked about wabi sabi, haiku, rural homes vs city life and more. This book, more than most others, engaged, entertained and stimulated my child. What more can you ask from a book? Copy editor... ha! I need to s-l-o-w d-o-w-n when I get all excited. too much: you're in college. What do the other students think of your pirate costume? 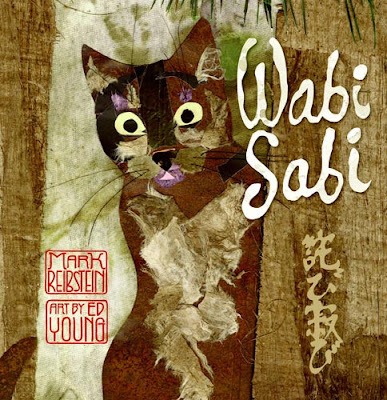 I hadn't seen this book before (yes, I know...been hiding under a rock for several years now *grin*), so thank you for bringing it to my attention because I adore both Ed Young's art, and the concept of Wabi Sabi (oh and cats too!). And thanks for visiting my blogs! I'll be following yours.